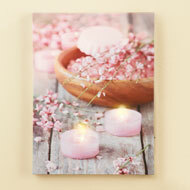 This beautiful lighted canvas is a wonderful way to add color and style to your home. 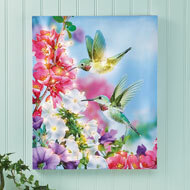 The scene features hummingbirds in a flowering garden, while 70 colorchanging, fiberoptic lights add sparkle and shine. The canvas includes an on/off switch on the side and hook on back for hanging. Req. 2 "AA" batteries (sold separately). Wood and polyester. 13"L x 17"H.
Accented with beautiful white flowers and greenery, this unique wall cross is a lovely addition to your home. 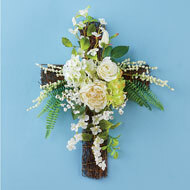 Beautiful anywhere in your home, the rattan cross features white roses, hydrangeas, peonies, baby's breath and greenery. Hanging hardware on back. Polyester and vine. 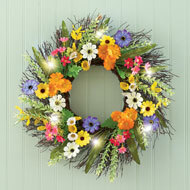 14"L x 20"H.
Featuring bright colors and beautiful blooms, this delightful wreath is the perfect addition to your springtime décor. 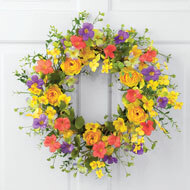 Hang on your front door or anywhere inside your home for a burst of seasonal color. 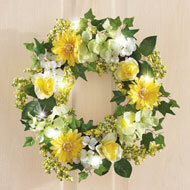 The flower and greenerycovered wreath features hydrangeas, roses, daisies, ivy and yellow berries, plus white lights for added sparkle and shine. Req. 3 "AAA" batteries (sold separately). Polyester, plastic and vine. 17"Dia. 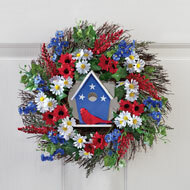 Give your front door the red, white and blue treatment with this patriotic wreath of flaginspired blossoms. 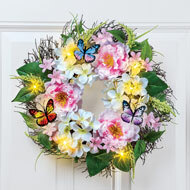 Daisies, roses and hydrangeas are featured with green ivy, colorful butterflies and 6 warm yellow lights. 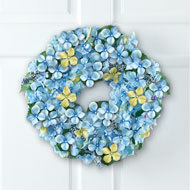 Beautiful wreath is the perfect way to greet guests on national holidays and all summer long! Requires 3 "AAA" batteries (sold separately). Hook on back for easy hanging. Plastic, vine and polyester. Measures 16"Dia. 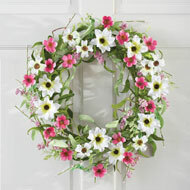 x 38"H.
Blooming roses, peonies, hydrangeas, green berries and daisies cover this gorgeous wreath in style, while ivy trails below and six lights add a warm glow. Colorful butterfly accents are the perfect finishing touch. Req. 3 "AAA" batteries (sold separately). Polyester, vine and plastic. 18"Dia. 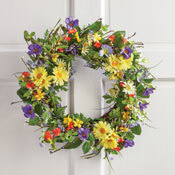 x 27"H.
Beautiful colors and lush greenery atop a lovely twig base make this wreath a wonderful addition to your home. 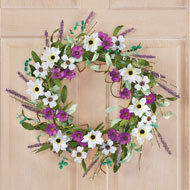 Perfect on a wall or door, it features purple and white wildflowers surrounded by greenery. Hook on back for easy hanging. Polyester and wire. Measures 22"Dia. 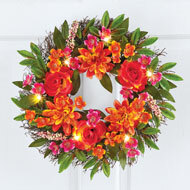 Decorate a wall, fence or porch rail with this set of three beautiful, solarpowered, lighted wreaths. 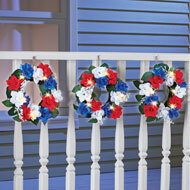 Each wreath is covered with red, white and blue roses and 5 lights that shine automatically at night.  Includes 1 "AA" rechargeable battery. Polyester, rattan and plastic; imported. Each wreath is 10"Dia. Total length is 60"L.
With a beautiful and calming glow, this lovely canvas will make a stunning addition to your home. It features pink flower petals and realisticlooking LED candlelight that brings it to life. Req. 2 "AA" batteries (sold separately). Includes on/off switch on the side and a hook on back for easy hanging. Polyester, plastic and wood. 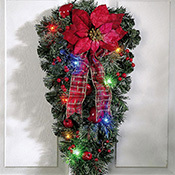 Measures 11 3/4"L x 15 3/4"H.
Beautiful wreath is a great way to add color to your front door or anywhere in your home. 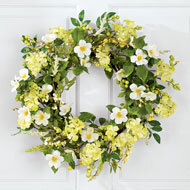 Featuring hydrangeas, white anemones, berries and greenery, this wreath is easy to hang with the hook on the back. Birchwood and polyester. 22"Dia. 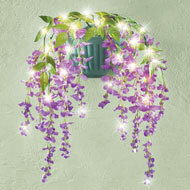 This beautiful hanging wisteria features lovely purple flowers, greenery and 24 warm white LED lights. This wall planter is batteryoperated so you can easily display it anywhere. Hook on back for easy hanging. Requires 3 "AA" batteries, sold separately. For indoor use or outside in a covered area. Includes a 6hour timer. Polyester, iron and plastic. 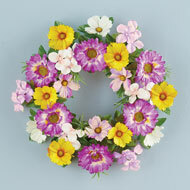 Plant is 21"H. Planter measures 8"L x 5"W x 6 3/4"H.
These heartshaped wreaths are loaded with charming daisies! 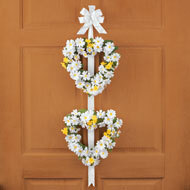 The pair of hearts feature white and yellow daisies accented with greenery hanging along a white ribbon. The wreaths are topped by a large hanging white bow. Polyester, plastic and wicker. 13"Dia. 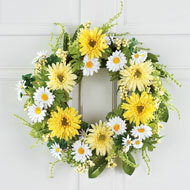 x 45"H.
Add refreshing spring color to your home with this beautiful wreath that's decorated with large yellow daisies, white daisies, greenery and berries. 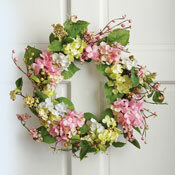 Cheerful wreath is completely covered in bright blossoms and hangs easily from a hook on the back. Polyester, and vine. 20"Dia. Light up the holidays in spectacular fashion. This beautiful swag features multicolored LED lights in a bountiful collection of faux evergreens, berries, apples, poinsettias and ribbon. Requires 3 "AA" batteries (not incl.). Polyester and plastic. 10"L x 21"H. Indoor use only. Bring nature's winter beauty indoors for an impressive holiday display. Lush pine boughs are dipped in "snow" and decorated with red berries and pinecones. 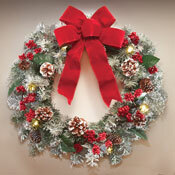 The wreath features a large red bow on top and req. 3 "AAA" batteries (sold separately). It sparkles with LED lights. Polyester, plastic, pinecones. 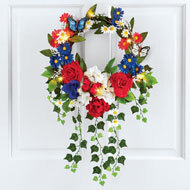 Wreath (18" Dia.). Greet your guests with this ghoulish wreath that features black mesh, colorful spider webs, silver accents and a superstylish skeleton couple. 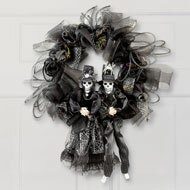 Spooky on your door or anywhere in your home, this unique wreath is a fun addition to your Halloween décor. Hook on back for hanging. Polyester and plastic. Approx. 23"Dia. 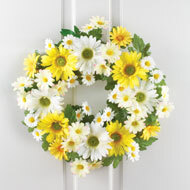 x 26"H.
These yellow and white daisies will make a bright and cheerful addition to your front door or any room inside your home. 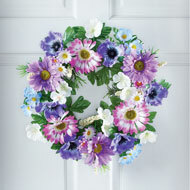 Flowers in different sizes and colors cover this beautiful wreath and are accented with lush greenery. Polyester and plastic. 17"Dia. 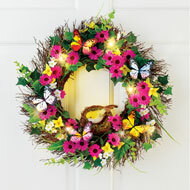 A beautiful design, bright morning glories and two lighted hummingbirds make this delightful wreath the perfect addition to your home. 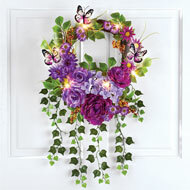 Hang on your front door or anywhere inside your home for a lovely burst of color. Hook on the back for easy hanging. Req. 3 "AAA" batteries (sold separately). Polyester, vine and plastic. 18"Dia. 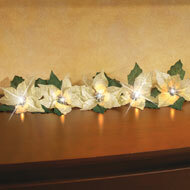 Make a festive statement this holiday season with this bold and beautiful, lighted poinsettia garland. Available in bright red or elegant white, the poinsettias are accented with sparkling gold accents. Endtoend connectors allow you to string several together for an even more dramatic display. Polyester, plastic and iron. 50"L. Colors available in Red or White. 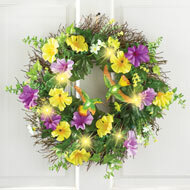 Decorate a wall, fence or porch rail with this set of 3 beautiful solarpowered, lighted wreaths. 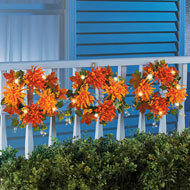 Each colorful wreath is covered with autumn colored mums, and the solarpowered lights shine automatically at night. Hooks on the back make hanging easy. Includes 1 "AA" rechargeable battery. Polyester and plastic; imported. 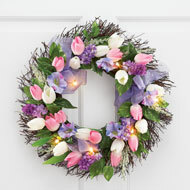 Each wreath is 1 0 1/2"Dia.